The Graco Remi 4-in-1 Convertible Crib and Changer will transform your child’s bedroom into a modern, functional, and stylish nursery. With a large drawer underneath the crib and an attached changing table featuring multiple drawers and shelves, the Graco Remi offers an abundance of storage space for all of your baby’s belongings. The Graco Remi 4-in-1 Convertible Crib and Changer has gorgeous clean lines and a low profile to give parents of all sizes easy access to their child. 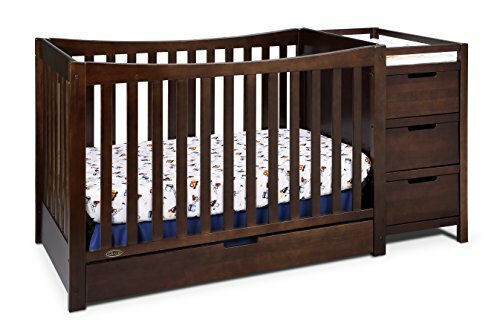 Made from quality pine wood and composites, this Graco crib will grow with your child as it easily transitions to a toddler bed (no guard rail), day bed, and full-size bed to last you many years. Available in multiple safe, non-toxic finishes, the Graco Remi 4-in-1 Convertible Crib and Changer is built to meet the industry’s highest safety standards and is JPMA Certified and CPSC compliant.